In early November 2017, a shroud of ambiguity clung to the US Department of Health & Human Services (HHS). Its headquarters—a mere stone’s throw from the US Capitol in Washington, DC—was still reeling from the exodus of former secretary Tom Price, MD, who had resigned in September following his purported misuse of taxpayer money to charter private jets. Fittingly, President Donald Trump would stoke the controversy. On November 13, 2017, he announced his top pick to fill the position: Alex Azar. Just 11 months earlier, Azar had stepped down from his position as president of pharmaceutical giant Eli Lilly and Company’s US division, where he was essentially in control of the company’s dealings with the US drug market. When Azar joined the company in 2007 (he began as its top lobbyist and senior vice president of corporate affairs and communications), the price of the group’s insulin lispro injection, Humalog, was just $74. In the decade that followed, its rising price correlated with Azar’s rise to prominence—it jumped nearly 300%. 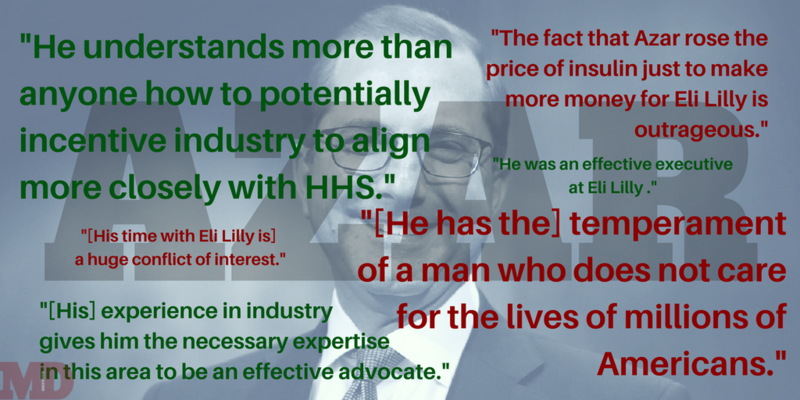 All the while, Azar was at the helm for Eli Lilly. But after a decade of purview over increasing drug prices, he’s suddenly changing his tune. During his questioning, Azar said he wanted to bolster competition for brand-name drugs and generics to facilitate price decreases—a tactic he reportedly sought from 2005 to 2007, when he was the deputy secretary for HHS during George W. Bush’s administration and when he also built a reputation as a demanding but practical and highly capable leader. While his testimony supports his expressed desire to “fight gaming the system of patients and exclusivity by drug companies,” his past does not—and Azar hasn’t been able to shake his past just yet. Many have expressed doubts that someone characterized by the price increases under his reign in the private sector could spur the opposite effect with his appointment to public office. Despite this, on Wednesday, January 17, Azar was approved by the Senate Committee on Finance as the next head of HHS by a vote of 15 to 12, advancing his nomination to the US Senate for final approval. Notwithstanding the shroud of uncertainty that has clung to him, his nomination was approved by the Senate on Wednesday, January 24, by a vote of 55 to 43. That same day, a hashtag, #SayNoToAzar, was trending on Twitter. So is Alex Azar the right man for the job? Many doctors interviewed by MD Magazine® shared doubts that a prior pharmaceutical company president could successfully address ever-climbing medication costs in the United States. 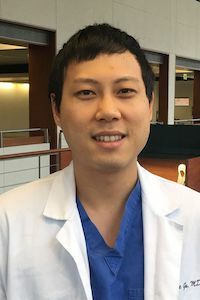 Eugene Gu, MD, a surgical resident at Vanderbilt University Medical Center, said that Azar’s industry tenure will spoil his ability to deliver as HHS head. Gu described Azar as someone with “the temperament of a man who does not care for the lives of millions of Americans.” He alleged that Azar used his experience as deputy secretary of HHS to obtain his later position with Eli Lilly, where he “raised the prices of many drugs, including [that of] lifesaving insulin,” Gu said. Moreover, Azar’s disregard for fair drug prices has detrimental effects on patient health, which can be seen in the clinic, Gu said. Outside the battle to rein in drug prices, there’s another elephant in the room for Azar: the Affordable Care Act (ACA), also known as Obamacare. President Trump is in favor of repealing the ACA, and Azar is in agreement with that line of thinking. Gu, along with a good chunk of his peers, is not. If Azar is appointed the secretary of HHS, he will oversee 11 health care–related agencies in the United States, including the FDA, the CDC, the National Institutes of Health, the Administration for Children and Families, and the Centers for Medicare & Medicaid Services. Physicians interviewed by MD Magazine® were skeptical of a nonphysician running a government office that affects every doctor in the United States. Aside from Tom Price, the past 5 HHS secretaries, including Azar (a former lawyer), have not been physicians. While Gu and others distrust Azar because of his past, others see him as an individual with a depth of experience and a chance to incite positive change. 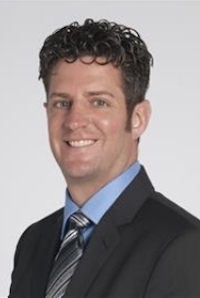 Such is the case for Christian T. Ruff, MD, MPH, an associate physician at Brigham and Women’s Hospital and an assistant professor of medicine at Harvard Medical School. He views Azar’s relationship with the pharmaceutical industry as a leg up for his current job. 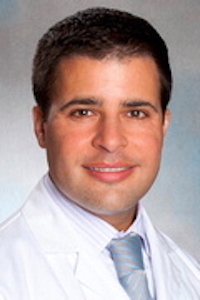 Pantalone, who receives yearly consulting, speaking, and/or advisory fees from multiple pharmaceutical companies, including Novo Nordisk, Sanofi, AstraZeneca, and Merck & Co., was wary of the nomination. However, he admitted that Azar’s experience in the pharmaceutical industry is beneficial because it gives him insight into how to trim prescription drug costs. Ruff agreed. “He understands more than anyone how to potentially incentivize industry to align more closely with HHS,” he said. The main gripe against Azar—that he’s to blame for swelling drug prices—might be confounded by several factors. Questions need to be answered when a drug’s market price is being set that may place the blame elsewhere, according to an industry expert. PBMs’ roles are especially important because these managers hold negotiating power that determines how much cost gets passed on to the patient. In recent years, PBMs have received steeper and steeper discounts for therapies. The percentage of that discount received by patients is where the picture gets murky—and where Azar’s relationship with Big Pharma becomes an asset. Improved transparency across the “medication continuum,” as Pantalone put it, is essential for more affordable and accessible medications because poor understanding and communication leads to a lack of clarity about potential savings. PBMs often claim to reduce the cost of medications by negotiating better drug prices with a manufacturer, but where the savings land is usually unclear. As middlemen between patients and manufacturers, PBMs certainly help themselves to a piece of the profits. In many cases, patients simply can’t afford the medications they need without third-party payer assistance. This is part of the reason that Azar and the pharmaceutical industry have come under such unforgiving public criticism. And if patients can’t afford their medication, physicians can’t do their jobs. Gu knows the impact Azar could have at the organization’s helm. “Decisions made by HHS are felt both immediately in terms of patient care and long term with regard to the research projects they help fund,” he said. There is no denying that Azar’s ability to make an impact is there—whether it’s positive or negative remains to be seen. “He was an effective executive at Eli Lilly who to our knowledge did nothing illegal or unethical. His constituency, if [he is] appointed secretary of HHS, is the American people, and we should hope his prior loyalty and effectiveness at his prior job will be reflected at HHS,” Ruff said. Azar may be a controversial figure, but there’s no denying that he brings a depth of experience. What remains to be seen is whether that experience will play out for better or worse. As it turns out, it’s up to Azar to figure out the answer. 1. Ramsey L. Eli Lilly tripled the price of insulin under Trump’s pick for HHS and Democrats are pouncing on that. Business Insider website. 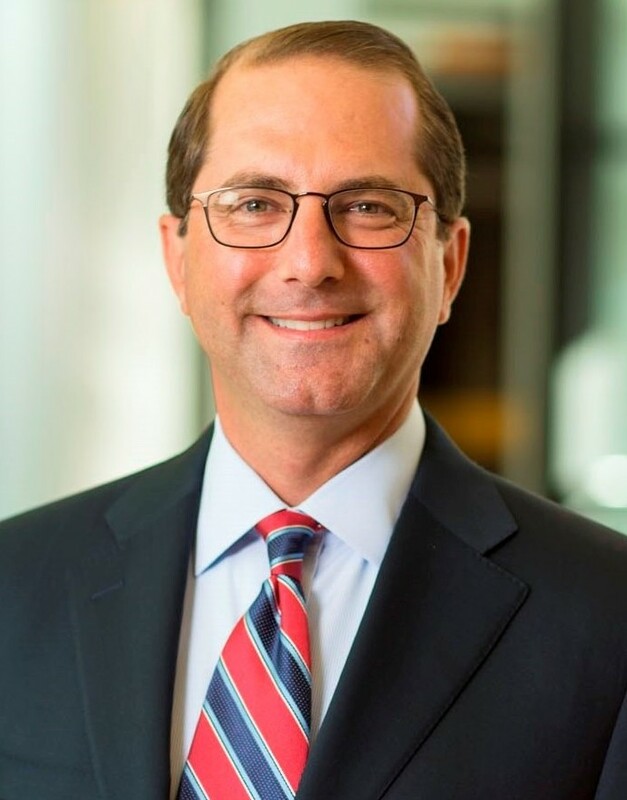 businessinsider.com/trumps-hhs-nominee-alex-azar-history-with-drug-pricing-at-lilly-2017-11. Published November 14, 2017. Accessed January 19, 2018. 2. Thomas K. Drug makers accused of fixing prices on insulin. New York Times. Published January 30, 2017. nytimes.com/2017/01/30/health/drugmakers-lawsuit-insulin-drugs.html. Accessed January 19, 2018. 3. Wapner J. How prescription drugs get their prices, explained. Newsweek. newsweek.com/prescription-drug-pricing-569444. Published March 17, 2017. Accessed January 22, 2018. 4. Schommer JC, Brown LM, Sogol EM; American Pharmacists Association. Career pathway evaluation program 2007 pharmacist profile survey. pharmacist.com/sites/default/files/files/Profile_24_PBM_SDS_FINAL_090707.pdf. Published June 2007. Accessed January 19, 2018.